President Vladimir Putin visited Serbia on January 17, making his first official trip to Serbia since 2014 and fourth since coming to power. Several-hour program was marked by the signing of more than twenty agreements. Also, contracts were signed to such areas as nuclear energy, space exploration, as well as digital technology, innovation and investments in high-tech and strategic areas. In particular, parties signed a Joint Statement on Strategic Partnership between the Russian Federation and the Republic of Serbia on the construction of the Center for Nuclear Science. However, the key issue of the Russian-Serbian summit talks was energy issues. Instead of the South Stream gas pipeline project, which was actually blocked by the West, Russia successfully builds the Turkish Stream pipeline, one of which is designed to supply Russian gas further to Europe. Serbia is objectively interested in becoming a key regional player in the system of transit of Russian gas further towards Central Europe. Moscow is ready to invest 1.4 billion dollars in expanding the infrastructure necessary for laying the Turkish Stream gas pipeline in Serbia. As part of the Russian-Serbian negotiations, an agreement was reached on additional investments in the amount of 230 million euros for the reconstruction of the local railway with a length of 210 kilometers by RZD, as well as in the construction of centralized operation centre, which will control all rail traffic in Serbia. Mutual trade is growing, and in 2017 it amounted around 2 billion dollars and continued to increase last year. Russian investments in the Serbian economy exceeded $ 4billion. Cooperation with the concern Gazprom Neft allowed the Oil Industry of Serbia company to become a leader in the energy market of the Balkan region. Export of Russian natural gas to Serbia have increased and Gazprom company is planning to increase them even more with plans to expand the capacities of the Banatski Dvor storage facility as well as the gas pipeline network in Serbia. Total Russian investments in Serbia in the next two years could reach $ 500 million, Kirill Dmitriev, head of the Russian Direct Investment Fund, said. Also, Russian president said they discussed military cooperation between two countries. President Putin had separate meetings with Serb politicians from Bosnia-Herzegovina and Montenegro. He met with Republika Srpska president Zeljka Cvijanovic and Bosnia-Herzegovina Presidency President Milorad Dodik and with the leaders of the strongest opposition party in Montenegro – Andrija Mandic and Milan Knezevic. Vladimir Putin awarded Aleksandar Vucic with the Order of Alexander Nevsky, and they jointly visited both the graveyard of the Russian soldiers who participated in the liberation of Belgrade during the Second World War, and the city’s largest Temple dedicated to Saint Sava, where they put the final pieces in a new mosaic. The city was ornamented with Russian and Serbian flags. 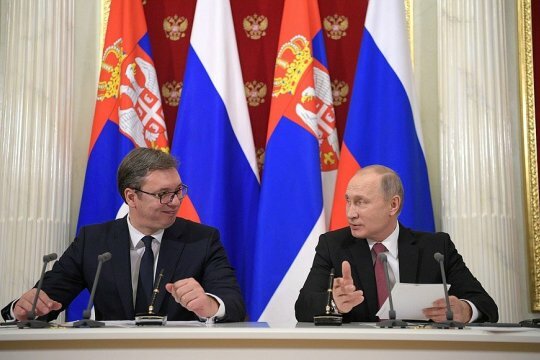 During the joint press conference, Russian president reflected on the normalization process between Serbia and Kosovo, emphasizing that Russia supports a mutually acceptable solution of Belgrade and Pristina, but based on the UN Resolution 1244. President Putin stated, that Kosovo’s authorities have recently undertaken provocative actions that have further undermined the regional stability, such as establishing the Armed Forces. ”The Resolution 1244 does not allow the existence of any armed formations in Kosovo except for the United Nations contingency. We share the concerns of Serbia, because we know that these steps lead to instability in the Balkans. Our support will continue.”, stated Putin. Russia’s President pointed out that trade of goods between Serbia and Russia has reached the value of two billion Euros, while the procurement of natural gas is also on the rise. The main reasons for the visit of Vladimir Putin to Belgrade were to agree on Serbia's entry into the free trade area with the Eurasian Economic Union, arrange further military-technical cooperation, and ensure Serbia's determination to participate in the Turkish Stream project. It is clear that under the rule of Aleksandar Vucic, Serbia will not enter into free trade with Eurasian Economic Union, while Russian energy projects are supported. One of the main reasons why Aleksandar Vucic received the Order of Alexander Nevsky is the military - security cooperation, which during the rule of Alexander Vucic significantly improved. Serbia received six fighter jets “MIG 29” from Russia, and in accordance with the military-technical cooperation with Belarus, this year four fighter jets “MIG 29” will be delivered. And together with the four Serbian fighter jets “MIG 29” will be sent for modernization to Russia, so Serbia will have a squadron of fighter jets equipped with modern weapons and radars. The upgrade process will cost around 185 million euros. Also, according to announcements, Serbia has already signed contracts with Russia worth around 280 million euros for the purchase of four MI-35M combat helicopters, three Mi-17 B5 transport helicopters and also for Pantsir-S1 self-propelled, medium range surface-to-air missile system. However, Serbia has much stronger cooperation with the West. Serbia concluded with NATO an Individual Partnership Plan (IPAP) in 2015, according to which NATO received the right to use the Serbian infrastructure. Today, in Serbia personnel of NATO member countries have the opportunity to move freely throughout Serbian territory and have diplomatic immunity. From 2012 to 2017 Serbia held 98 military exercises with NATO and only 12 with Russia. Exercise “Serbia 2018” was the largest NATO civilian exercise in history of the Alliance, which was held from 8 to 11 October in Serbia. Around 2,000 participants from 38 countries practiced wide range of emergency responses. Maintaining such a large exercise in Serbia, was a direct provocation of Russia, because Russian Humanitarian Center in Nis is intended for elementary disasters and emergency situations. Also in January is expected the adoption of the new Individual partnership action plan (IPAP). The draft of the agreement has been submitted to NATO officials and their answers is the only thing left, stated head of delegation to NATO’s Parliamentary Assembly and a member of the Security Services Control Board Dragan Sormaz. During 2018, Serbian army took part in two major NATO-exercises as an observer, and Serbian soldiers were engaged in ten exercises which were organized or participated by NATO member countries. At the same time, employees of the Russian-Serbian Humanitarian Center in the city of Nis did not received diplomatic immunity. In a visit to Belgrade in April 2017, the late Senator John McCain noted that the United States is Serbia’s most important defense partner with the two countries engaging in ninety joint military activities per year. And most importantly, the NATO Liaison Office in Belgrade is located in the building of the Serbian Defense Ministry, just one floor beneath the office of the defense minister. Another project of the Serbian government, which attracts the attention is the announced construction of a highway between Serbian city of Nis, Kosovo’s Pristina and Albania’s Durres, so that Serbia could get its harbor on the Adriatic. However, why would Serbia need highway to port in Durres, when Serbia has port of Bar in Montenegro. Especially having in mind that a lot of Serbs live in Bar, as well as throughout Montenegro. The answer is simple, the highway Nis - Pristina - Durres is needed by NATO troops, for a better and safer move to Bulgaria, in case of disabling the passage of NATO ships through Bosphorus. In terms of economic cooperation, things are also clear, the value of Serbian-Russian trade has indeed increased to over 2 billion euros, but the value of Serbian trade with EU is around 11 times larger-almost 25 billion, and 63% of Serbia’s foreign trade is with the EU countries. When Aleksandar Vucic praise how he refused Western pressure to impose sanctions against Russia, that is only because of the Serbian nation and the majority of its voters. When he would officially introduced sanctions to Russia, he would turn the majority of the Serbian people against him. Even though agriculture is the biggest development chance of Serbia, Aleksandar Vucic did not allow Serbia to enter seriously on the big Russian market in 2014, at that time, Aleksandar Vucic refused to grant state grants to Serbian farmers. Bearing in mind the popularity of Vladimir Putin in Serbia, Aleksandar Vucic wanted to use President Putin's visit for his personal political interests, as a response to the weekly protests against him that have been going since the beginning of December. The ruling party has organized transport of many of its members from across the country to greet Putin and politicaly exploit his arrival. The participiants were carrying the banner titled “One of the 300 million”( there's a saying among Serbs “Us and Russians 300 million“ although that number is actually much smaller), which was an obvious reference to the title of the protests against Aleksandar Vucic, which is “One of the five million”. Vucic planned that Putin would address the people in front of the Temple of Saint Sava, sending a message that Russia supports Alexander Vucic's policy. President Putin rejected that. Vladimir Putin addressed the people in front of the Temple of Saint Sava with the words in serbian: "Thank you for your friendship!" Vladimir Putin in Belgrade was greeted by more than 120 000 people. In addition, he is the most popular politician in Serbia. It's hard to find an example that more than 120,000 people in a European country are gathered on the streets of the capital to welcome the president of another country. The statement by Russia's President Vladimir Putin that Russia will support any Belgrade-Pristina agreement within the framework of Resolution 1244, is encouraging. That is exactly what must be the basis of Russian policy towards the current Serbian authorities. Because in the case of the acceptance of Aleksandar Vucic's plan to divide Serbs and Albanians, the consequences for Serbia would be catastrophic. It is in the interest of Russia that its main ally in the Balkans become economically and demographically strong, but under the rule of Alexander Vucic things are going in the other direction. This primarily refers to demography. Around 60 000 people leave Serbia per year, while around 40 000 die more than it is born. In other words, Serbia decreases annually for nearly 100 000 people. These are the results of the Aleksandar Vucic’s rule. Russia needs a new strategy towards Serbia. Russian investments, which in addition to the energy sector, should also focus on Serbian agriculture. By investing in Serbian agriculture, Russia would significantly strengthen its position in Serbia and economically strengthen Serbia. Vladimir Putin's visit has also shown the strengthening of russophobia by NGOs funded by the West. A situation similar to that with Montenegro. In Montenegro, the absolute majority of the population advocated brotherly relations with Russia, and in all polls, the majority of the population was opposed to joining NATO. However, the West has enabled the creation of an authoritarian system in Montenegro, led by Milo Djukanovic, which with undemocratic methods, has brought Montenegro into NATO. Almost the same is now done with Serbia. Aleksandar Vucic, who runs with methods almost identical to Milo Djukanovic, is a person who fulfilled or wanted to fulfill all the strategic requirements of the West. How willing he can go in that direction could be seen when the Serbian Orthodox Church openly opposed his plan of division with the Albanians. Then, direct attacks by the media in Serbia, as well as members of his government, were launched to the Serbian Orthodox Church. In line with the above, it is necessary to enable the opening of the pro-Russian television with national frequency in Serbia, to strengthen pro-Russian NGO movements, to strengthen local patriotic movements. A mistake similar to that with Milo Djukanovic, must not be repeated. Will the Trans-Caspian Pipeline Be There Despite Russia's Opposition? 804: 30 seconds to mars. Vladimir Putin in Serbia - brotherhood and geopolitics25 January 2019: Vladimir Putin in Serbia - brotherhood and geopolitics! лучшие комедии. Vladimir Putin in Serbia - brotherhood and geopolitics.